A SpeakEasy is an informal audience discussion facilitated by a Walker tour guide and a local performer or choreographer. Today’s edition highlights themes shared during a conversation on Saturday, December 8, about Deborah Hay’s As Holy Sites Go. As Holy Sites Go concluded the Walker’s Deborah Hay Celebration, a week of events recognizing the career of this dynamic performer and choreographer. A former dancer in the Merce Cunningham Dance Company, Hay was a founding member of the Judson Dance Theater, which formed in New York in 1962. Bolstered by that community, she embarked on decades of dance exploration with “trained” and “untrained” performers. Thereafter, through a series of solos, Hay honed her choreographic process, begun with a series of questions and developed into a script that guides the performer, who makes decisions and enacts this exploration, in real-time. 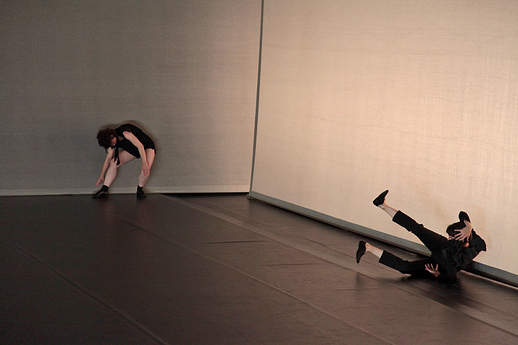 The questions posed by Hay resonate beyond the performing context and linger long afterwards. Discussing her work Beauty, she offered the query “What if where I am is what I need”? Specifically considering the performing context, this question has relevance for both performers and audience members. As Hay’s dancer’s open themselves to the disparate possibilities of a moment, so, too audience members are tasked with being open and aware in following that course, wherever it may lead. For a few of us, this exploration ultimately led to the Walker’s Balcony Bar for a post-performance SpeakEasy discussion. Themes and concepts shared in that conversation are featured in this post, and additional questions and thoughts are welcomed in the comments section below. How might the theater function as a ritual site? Is it a type of holy space, reserved for a unique form of attentive, hushed experience? As Holy Sites Go is performed in silence, broken by brief vocalizations, subdued percussive accents, and the occasional soft shush of shoe against floor. The audience contributes to this score, perhaps unintentionally, through the squeak of a chair or a stifled cough. Already perhaps self-aware given the desire to maintain quiet, the audience is further drawn into the performance by the lighting, which remains on seats throughout the majority of the evening. For some, this may cause discomfort, drawing attention to each small shift, making one aware of one’s body or persona in the theatre. Yet for others, this opens up a communal engagement. One audience member recalled leaning forward and noticing that movement echoed row after row. This notion of community brings to the fore a precious undercurrent in this viewing experience. A generosity is requested of both performers and audience members, asking us to allow each moment to unfold as it may, to be patient as the performers strive to find the next impulse, to be actively present as they seek something “genuine” that lies behind habit, convention, beauty, or reason. This is perhaps the secular holiness of the theatre, the focused energy of audience and performers coalescing in this space during this limited time. One audience member brought forward the concept of “achievement” in contrast to Hay’s movement aesthetic. Throughout the piece, she noted that dancers followed impulses, yet almost as soon as these were recognized, they were discarded, overridden by the next impulse and a reconfiguration of the current moment. In this sense, the actions were without consequences, nothing was achieved or fulfilled, for achievement exists in a linear trajectory of progress and Hay demands that we sever this moment from before/after, that we focus on the emerging now. As this process unfolds, it is hard to resist layering emotion or narrative onto the evolving vignettes. SpeakEasy participants shared diverse interpretations. Periods of prolonged stillness with bodies collapsed to the floor, then reanimated to begin the next scene, reminded one viewer of reincarnation. Others saw moments of interspecies communication, fighting, sexual seduction, twinspeak, or soaring through a clear blue sky. One line was uttered during the performance by each dancer, a comment from Samuel Beckett’s The End, “Strictly Speaking I believe I’ve never been anywhere.” But, what is it to truly be somewhere, anywhere? What is it to fully embody and experience this moment? A number of audience members shared a feeling of expanded time, of time not as a quick succession of seconds, but rather time in the form of eons, in the slow periodicity of erosion. Described by Hay as a “continuity of discontinuity,” As Holy Sites Go does not build a forward momentum from beginning towards climax and resolution. Instead, each movement is presented for consideration on its own and we are invited to strive to stay with it, to experience this hour moment by moment in this space together. Thank you to local performer, choreographer, and author Judith Brin Ingber for joining me to lead the SpeakEasy for As Holy Sites Go. The next SpeakEasy will be held on Saturday, January 12, when we will discuss Rude Mechs’ The Method Gun. This will be the first performance of 2013’s Out There Series. We hope to see you then!